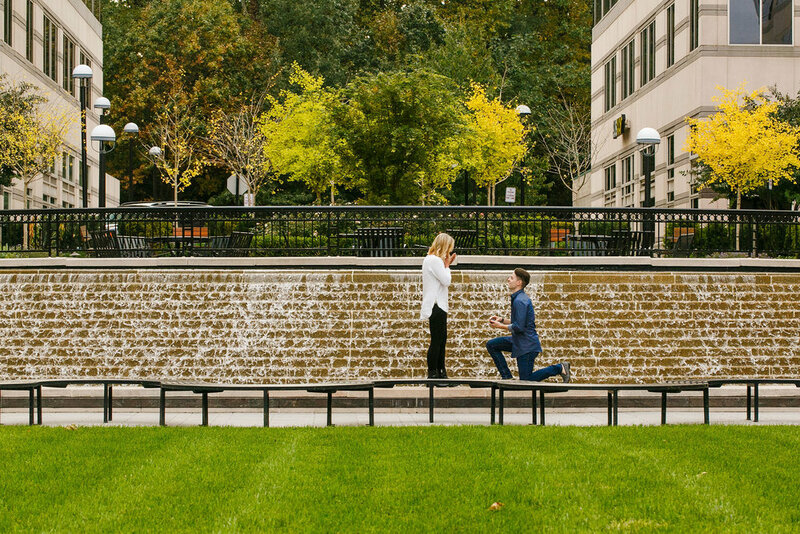 The Reflecting Pool is an iconic spot for a surprise proposal with a DC view! The steps of The Lincoln Memorial can be crowded at times with tourist so by proposing in front of The Reflecting Pool you get a similar view of The Washington Monument without tourist behind you since no one will be in the water! If you propose off to the side slightly you can also get a view of The Capital Building peeking out from behind the monument. If you’re more centered The Washington Monument would hide The Capital. After the proposal you can get some great shots with The Lincoln behind you. During Cherry Blossom peak bloom you can also walk a little bit to get some shots with the trees! Lots of options within a small walking distance. Get in touch to learn more about planning a surprise proposal in the Washington DC area! Surprise Proposal Photography includes detailed planning & advice, photography session to capture the proposal moment, portraits afterwards and your online gallery of your beautifully processed high resolution images delivered in less then 7 days. The online gallery is easy to share with friends and family! Jon Fleming Photography specializes in capturing couples love stories from the surprise proposal to the wedding day! Photography also offered for engagements, weddings, corporate events and head shots. Photo booth rentals are available for weddings and events! Ask about our GIF/Boomerang digital photo booth! Constitution Gardens in Washington DC is located between The Washington Monument and The Lincoln Memorial on part of The Mall. It’s a small piece of land surrounded by a pond that is accessible by a small wooden bridge. It makes a great proposal location for a perfect unobtrusive view of The Washington Monument in the background. The location is very private and normally has few tourist in the area as many of the tourist spend time at the nearby memorials. This makes for the perfect location that includes the view of the monuments without the large crowds of tourist. This spot also commonly has ducks and lots of greenery surrounding. After the proposal moment some friends rushed over to congratulate the newly engaged couple! Capturing the reactions of the friends was also a great moment! Including friends or family after your surprise proposal is a great way to have a second surprise and get photos with those friends and family members as well as more great reaction shots! Surprise Proposal Photography includes detailed planning & advice, photography session to capture the proposal moment, portraits afterwards, and your online gallery of your beautifully processed high resolution images. The online gallery is easy to share with friends and family! Jon Fleming Photography specializes in capturing couples love stories from the surprise proposal to the wedding day! The Plaza America shopping center in Reston, Virginia was right near a restaurant that this couple frequented. This backdrop and small park area nearby made a great spot for a surprise proposal with very few people around! Find a location with few people around makes for a private proposal and lots of room to work with for photography without the worry of people walking into the shot. The waterfall and trees during the fall made a beautiful background. After the surprise marriage proposal we didn’t have to walk very far to get some fun portraits!